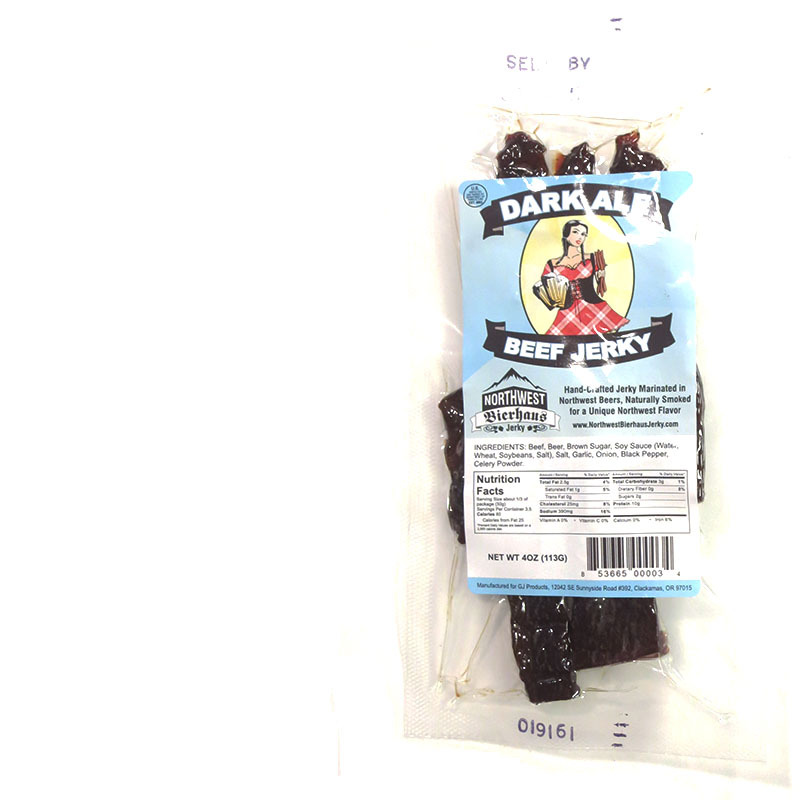 Northwest Bierhaus Jerky is a brand owned by GJ Products, based out of Clackamas, OR. It's run by Glenn Loehr who started it in 2015. The company also owns, "Oregon Wine Country Jerky". Together, the two brands infuse the flavors of craft beer and wine from the Pacific Northwest, and target the tourist and gift basket markets. This, "Dark Ale" variety is described by the company as combining the, "hearty dark ale with mouth-watering premium beef", and says that jerky snackers will love the "high quality nutty flavor". Beef, beer, brown sugar, soy sauce, salt, garlic, onion, black pepper, celery powder. The first flavors that hit my palate is a garlic and onion seasoning, followed by a noticeable sweet. The chewing brings on a light touch of soy sauce, along with hints of black pepper. For being marketed as, "Dark Ale", it actually does have that beer-marinated flavor, mostly noted by the presence of malt. As far as "nutty" is concerned, yes, it has some of that flavor, but overall it's more of that grain flavor you get when you let beef soak in dark ale overnight. Otherwise, the primary taste profile is that of a light garlic and onion seasoning, with a noticeable sweet. The soy sauce adds a bit of salt, while the malt flavor fills in the background. The meat consistency looks great. These are thick strips of whole muscle, appearing lean with no visible signs of fat. Chewing is chewy, and slightly tough at first, but breaks apart easily. It takes on a meaty feel, with a little bit of a steak-like texture. Handling is sticky. 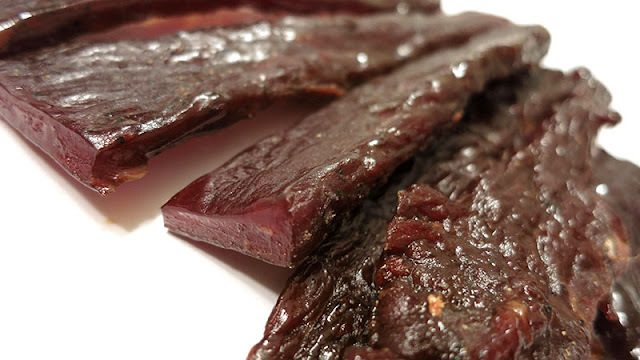 This Dark Ale Beef Jerky from Northwest Bierhaus serves up a malty representation of dark ale-marinated beef. You're not going to taste the overwhelming flavor of a Rogue Hazelnut Brown Ale, or a Deschutes Porter, but you will taste the overtones of malted barley in the background. 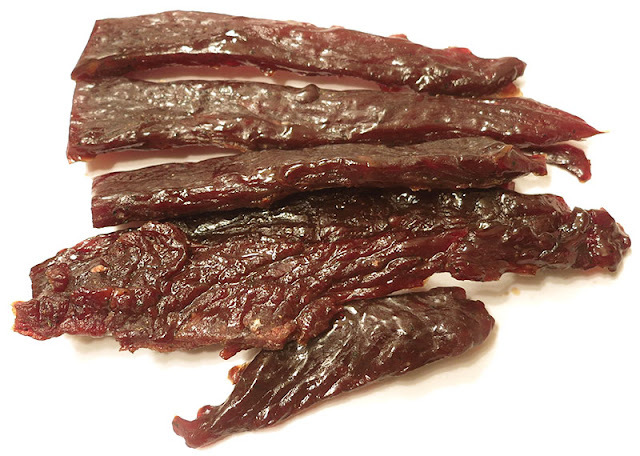 Otherwise, it's a lightly seasoned jerky most notable for its thick, meaty strips, which can be tough at first bite. That toughness will eventually wear on you, and you'll find there's not enough flavor-reward to keep you going. Otherwise, it's a great gift item and tourist souvenir.